The new Tecnicomar Reverse Osmosis Watermakers produce 60% more drinking water, consuming 35% less energy compared to systems of the same dimensions. The product line of Tecnicomar Sailor Special Green Marine Watermakers was created with the aim of limiting the energy demand per liter of fresh water produced. Thanks to a full process and to the installation of highly innovative membranes, the system allows 35% energy savings compared to traditional Reverse Osmosis systems. It is equipped with a microprocessor that manages all the functions and sensors. The one-touch system can be switched to manual operation, if needed. The Reverse Osmosis Marine Watermaker Tecnicomar Sailor Special Green is characterized by the simplicity of use and the high quality of its components, such as the high pressure pump in stainless steel with ceramic piston, the structure in powder-coated stainless steel, FDA compliant filters and ASME & TUV certified high-pressure fiberglass vessels. The standard configuration is full-featured ready for installation, with automatic pressure regulation device and installation kit. On request, it can be supplied with an automatic membrane flushing system and a remote control. Sailor Compact is the Reverse Osmosis Marine Watermaker ideal for all sailing and motor boats and is also an optimal system for yachts and super yachts and for all those vessels that need a modest amount of fresh water. 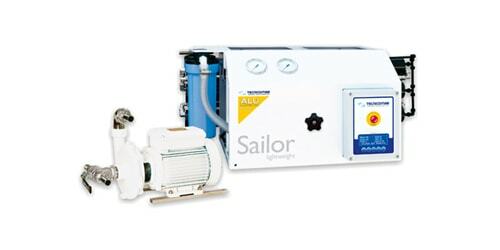 The Sailor Compact Watermaker is equipped with a one-touch comfort system managed by a microprocessor that can be reversed to manual operation, if necessary. 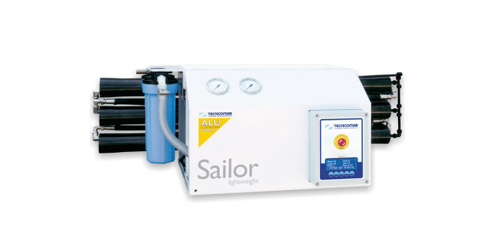 The Sailor Compact Marine Watermaker stands out for its easy use and the high quality of its components, such as the high pressure pump in stainless steel with ceramic plungers, the powder-coated aluminum structure and the TÜV certified corrosion free and lightweight carbon fiber vessels. The standard configuration is full-featured ready for installation, with automatic pressure regulation device and installation kit. On request, the system can be equipped with an automatic membrane fluxing system. Available in two configurations for a convenient installation: compact and modular (Slim) for installation in limited spaces.